The 4-Series of AudioQuest speakers cables may be the most successful in AudioQuest’s 30+ year history. Type 4’s roots go all the way back to the late 80’s. The fundamental geometry and conductor complement of Type 4 hasn’t changed since 1995 … because any change to the size or position of the 4-Series’ 2-sized Spread-Spectrum conductor arrangement would reduce performance. 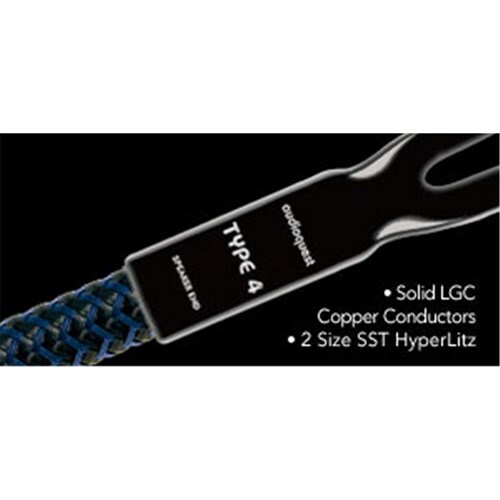 Type 4’s solid Long-Grain Copper allows a smoother and clearer sound than cables using typical OFHC (Oxygen-Free High-Conductivity) copper. OFHC is a general metal industry specification regarding “loss” without any concern for distortion. LGC has fewer oxides within the conducting material, less impurities, less grain boundaries, and definitively better performance. All four of Type 4’s conductors are solid. Electrical and magnetic interaction between strands in a conventional cable is the single greatest source of distortion, often causing a somewhat harsh, dirty and confused sound. 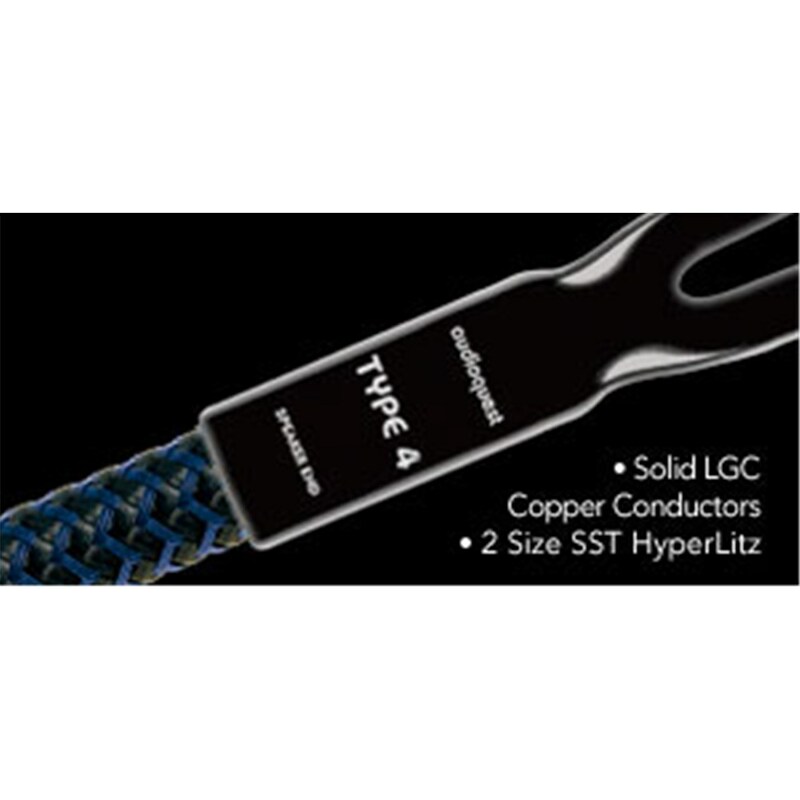 Solid conductors are the most important ingredients enabling Type 4’s very clear sound. Whether a conductor is solid or stranded, skin-effect is a prime distortion mechanism in speaker cables. Type 4 very simply keeps this effect out of the audio range by using conductor sizes that are below the threshold for audible distortion. 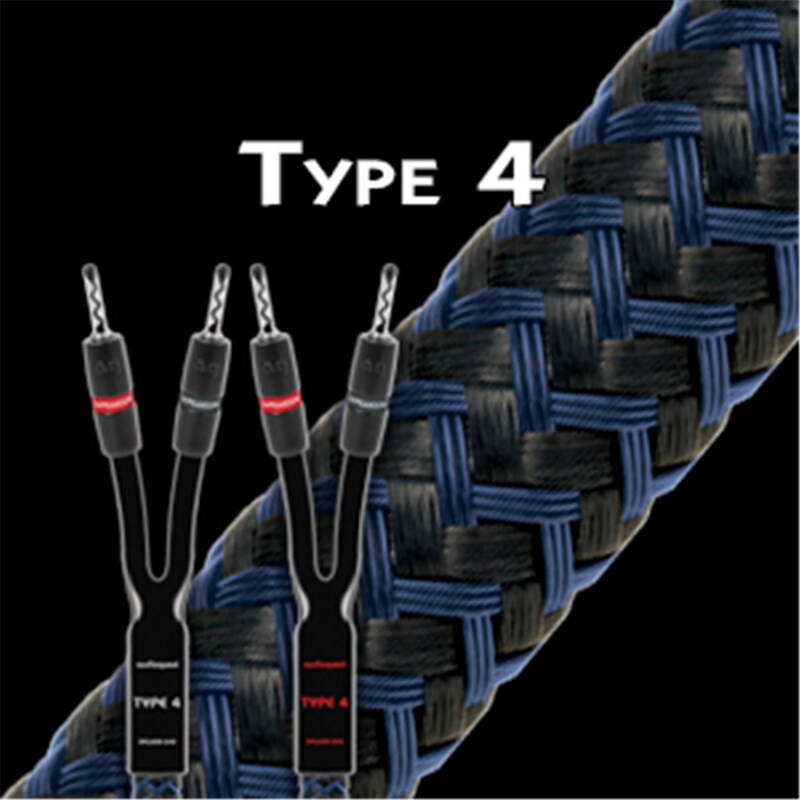 The two negative conductors in Type 4 are insulated with partially conductive Carbon-Loaded Polyethylene. This remarkable material damps radio-frequency garbage from being fed back into the amplifier. The sonic benefit is exactly the same reduction in “hash” and better dimensionality that comes whenever RF garbage is reduced in an audio circuit. 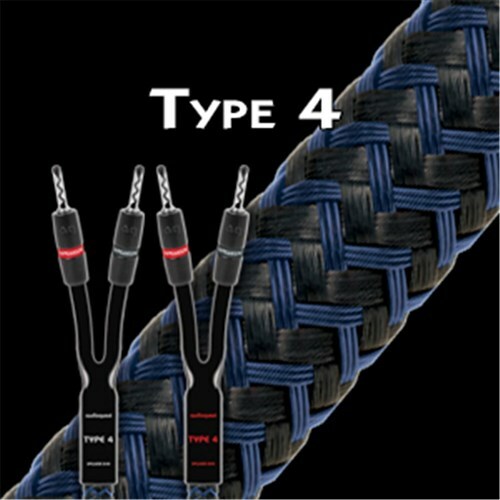 Type 4 uses Nitrogen-Injected Foamed-Polyethylene Insulation on its positive conductors because air absorbs next to no energy, and Polyethylene is low-loss and has a benign distortion profile. Thanks to all the air in Foamed-PE, it causes much less of the out-of-focus effect common to other materials. The relationship between conductors defines a cable’s most basic electrical values (capacitance and inductance). However, even when those variables are kept in a reasonable balance, the relationship between conductors can be varied in ways that greatly affect the sound. The Star-Quad construction of Type 4 allows for significantly better dynamic contrast and information intelligibility than if the same conductors were run in parallel. Any single size or shape of conductor has a specific distortion profile. Even though radially symmetrical conductors (solid or tubular) have the fewest discontinuities, any conductor of a particular size does have a sonic signature. SST is a method for significantly reducing the awareness of these character flaws by using a precise combination of different size conductors. The different SST-determined conductor sizes used in Type 4 allow an exceptionally clear, clean and dynamic sound. 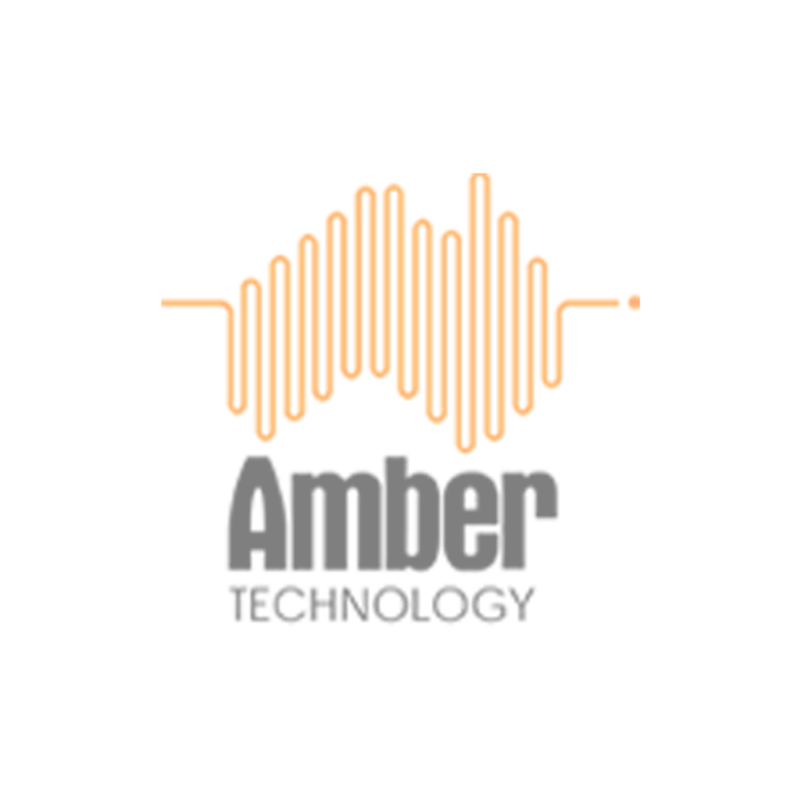 AudioQuest offers a wide range of high-quality connectors that allow Type-4 to be securely attached to any type of equipment. Quality is in the low-distortion sound, not necessarily in the eye-candy effect. AQ ends are either a dull looking gold or silver because these metals are plated directly over the connector. There is no shiny and harsh sounding nickel layer underneath. AQ PK-spade plugs are soft because better metal is soft, and facilitates a higher quality connection. For pieces requiring a banana plug or BFA connector the AQ PK-BFA/Banana provides unprecedented performance over conventional brass versions.